Amidst many announcements ASUS made during Computex 2013, most of which were high end, premium devices, a few budget conscious devices were announced as well. ASUS (thankfully) addressed the fact that their low-end tablet range, the MeMO Pads, were far too low-end to make their low price tag worth it. In fact, the new members of the MeMO Pad line, the MeMO Pad 7 HD and the 10 FHD, offer a lot of bang for the buck, keeping the same price as their predecessors ($149 for the 7 HD and $299 for the 10 FHD). Definitely an excellent refresh to the original lack-luster MeMO Pad, this new version of the 7-inch tablet discards the Nexus 7-originated rubbery texture in favor of a glossy plastic. Like the previous MeMO Pad, this tablet comes in multiple color options, like a white, pink, yellow and blue version. Apart from that change in the back casing, there doesn't appear to be much change in the design. The ASUS logo below the screen remains, but the bezels (both horizontal and vertical) appear slightly smaller. The display is the same 7" IPS unit from the last MeMO Pad, but it receives a significant bump from 1024 x 600 to a 1280 x 800 resolution, equaling the Nexus 7 with 218ppi. The SoC in the MeMO Pad 7 HD may not be as good as the Nexus 7's Tegra 3, though. A MediaTek SoC with a 1.2GHz quad-core Cortex-A9 CPU and a PowerVR SGX544 GPU powers the 7 HD, with 1GB of RAM memory. While the CPU should be competitive enough (better than the iPad mini's at least), I can't ascertain how good the GPU is (the 544 can have more than one core, and the clock speed is also unknown), but if we assume that it is a single SGX 544 core running at its max clock speed (533MHz), then we can expect performance on par with an iPad 2 (also the iPad mini), so it should be competitive enough. The 7 HD should also be slightly lighter than the iPad mini,weighing 302g, however still considerably thicker (10.8mm). Unlike the Nexus 7, the MeMO Pad has dual cameras: a 5MP piece on the rear, capable of 720p video, and a 1.2MP shooter on the front. The MeMO Pad 7 HD is expected to launch roughly around July, and will be available in 8 and 16 GB versions. This tablet's greatest advantage over the Nexus 7 is that the 8 GB version ships for just $139, establishing itself and one of the first sub-$150 tablets that is actually decent, spec-wise. 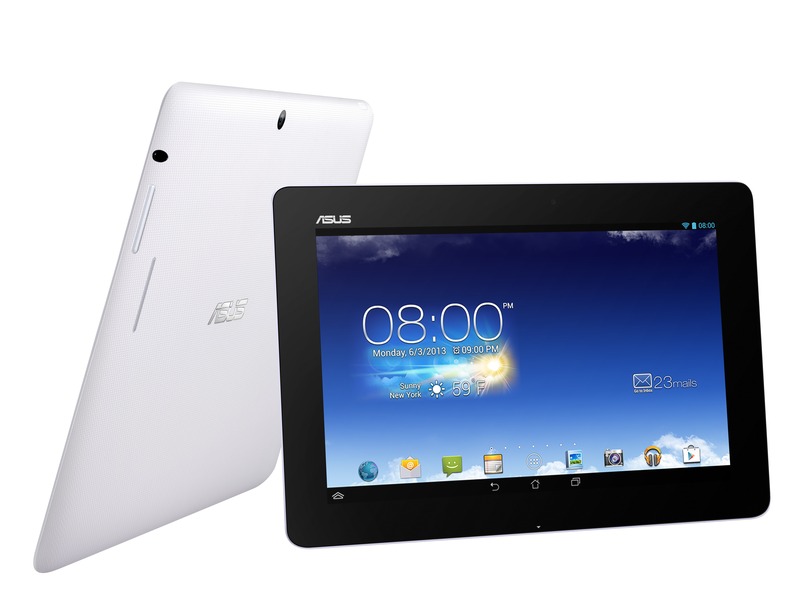 ASUS made a pretty decent budget 10" tablet with the original MeMO Pad 10 Smart. It offered a light tablet, a decent display and SoC, all for just $299. In fact, I think this is the cheapest 10-incher around. Now that ASUS is refreshing this tablet with a much better spec-sheet, they managed to make a very good, yet very cheap 10" tablet. Design-wise, the new MeMO Pad 10 doesn't change much. The back has the same layout: dual speakers located on either end of the device (in landscape), an ASUS logo in the center and a camera on the top-center of the device. The back is made of plastic, and will be available in multiple color options (blue, pink and white). The tablet weighs 580g and has practically the same thickness (9.5mm) as the iPad 4. What is impressive about the MeMO Pad 10 FHD, especially for the price, is that, as its name suggests, its display will have Full HD resolution (1920 x 1200). As usual, this tablet's display is an IPS unit, which means great viewing angles. The rear camera is a 5MP unit capable of shooting 1080p video, while the front-facing camera is 1.2MP. This is a very interesting tablet, because it is one of the few Android tablets that have an Intel Atom processor. This tablet, in fact, comes with a Clover Trail+ SoC, hence it should be a good perfomer. This particular SoC (codename Z2560) uses two Saltwell cores running at 1.6GHz (HyperThreading enabled). The GPU is a PowerVR SGX 544MP2 at up to 400MHz, so the gaming performance should be slightly less than that of the iPad 3. The memory consists of 2 GB of RAM with a memory interface of dual-channel LPDDR2-1066 (8.5GB/s), which should be enough to keep framerates smooth, unless you decide to play more complex 3D games. The MeMO Pad 10 FHD is expected to be available as of Q3 2013, the entry-level 16 GB version being available for just $299, establishing the MeMO Pad 10 as an excellent Android tablet for a very low price.